Arenus Pet makes quality supplements for pets that are extremely important in promoting good health. Sometimes dogs can’t get the nutrients they need from their regular food so it’s important to give it to them as a supplement. With my Chihuahuas, their digestive health is the most important thing. Pixie has had issues with this in the past, and I have found that many times, since they are all so tiny, the slightest amount of food that they sneak from the table, can mess up their digestive system for a day or two. I received some samples from Arenus from the Assure line. I got Adult & Weight control and Puppy & Performance blend. If you feed 25% protein or less, you can use Adult & Weight Control for your dog. If you feed more than 25%, you can feed Puppy & Performance. Well, my dogs are split down the middle. Two have a limited diet and the other 2 can use all the protein they can get. 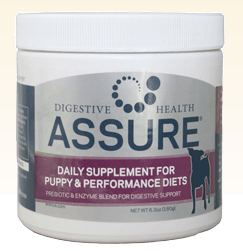 Assure Canine is a blend of prebiotics and enzymes that help your dog absorb nutrients and improve immune function. It also aids in digestion so your dog can properly digest and get rid of waste. After using this product on my dogs for several weeks I noticed a steady change in how much of a routine they got on with using the bathroom regularly. It was no mess, and I also noticed they were less gassy. Pixie gets really bloated sometimes and it makes her look a little chubby. She looked great thanks to Assure and Grace wasn’t gassy at all anymore! It was so easy to use, I just scooped some out and put it on their food. They ate it with no problems and didn’t seem to even notice it was there. 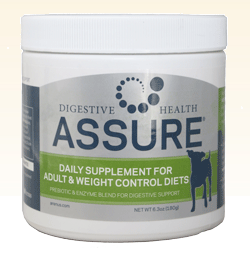 One winner will receive Assure Digestive Supplement for their dog! I would chose the adult and weight control. I would pick Adult & Weight Control!